Massive terrestrial planets, called "super-Earths," are known to be common in our galaxy, the Milky Way. Now a Northwestern University astrophysicist and a University of Chicago geophysicist report the odds of these planets having an Earth-like climate are much greater than previously thought. 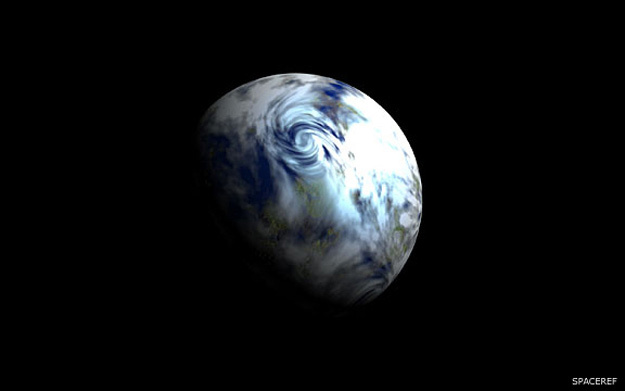 Nicolas B. Cowan and Dorian Abbot's new model challenges the conventional wisdom which says super-Earths actually would be very unlike Earth -- each would be a waterworld, with its surface completely covered in water. They conclude that most tectonically active super-Earths -- regardless of mass -- store most of their water in the mantle and will have both oceans and exposed continents, enabling a stable climate such as Earth's. Cowan is a postdoctoral fellow at Northwestern's Center for Interdisciplinary Exploration and Research in Astrophysics, and Abbot is an assistant professor in geophysical sciences at UChicago. "Are the surfaces of super-Earths totally dry or covered in water?" Cowan said. "We tackled this question by applying known geophysics to astronomy. "Super-Earths are expected to have deep oceans that will overflow their basins and inundate the entire surface, but we show this logic to be flawed," he said. "Terrestrial planets have significant amounts of water in their interior. Super-Earths are likely to have shallow oceans to go along with their shallow ocean basins." Cowan also will discuss the research at a scientific session to be held from 2 to 3:30 p.m. EST Wednesday, Jan. 8, at the AAS meeting (Potomac Ballroom D, Gaylord National Resort and Convention Center). The study appears in the Jan. 20 issue of the Astrophysical Journal [http://iopscience.iop.org/0004-637X/781/1/27/article]. Water is constantly traded back and forth between the ocean and the rocky mantle because of plate tectonics, Cowan and Abbot say. The division of water between ocean and mantle is controlled by seafloor pressure, which is proportional to gravity. "We can put 80 times more water on a super-Earth and still have its surface look like Earth," Cowan said. "These massive planets have enormous sea floor pressure, and this force pushes water into the mantle." It doesn't take that much water to tip a planet into being a waterworld. "If Earth was 1 percent water by mass, we'd all drown, regardless of the deep water cycle," Cowan said. "The surface would be covered in water. Whether or not you have a deep water cycle really matters for planets that are one one-thousandth or one ten-thousandth water." "Such a feedback probably can't exist in a waterworld, which means they should have a much smaller habitable zone," Abbot said. "By making super-Earths 80 times more likely to have exposed continents, we've dramatically improved their odds of having Earth-like climate." "These are the two things we would like to know better to improve our model," Cowan said. "Our model is a shot from the hip, but it's an important step in advancing how we think about super-Earths." The paper is titled "Water cycling between ocean and mantle: super-Earths need not be waterworlds." Massive terrestrial planets, called \"super-Earths,\" are known to be common in our galaxy, the Milky Way.